Lee Valsvik, Class of 1978; local media personality. They will be honored at a special dinner on Friday, June 2 and also the next day during the 2017 commencement ceremony. Tickets to the dinner can be purchased at partnershipplan.org. Read more about our Distinguished Alumni online. Construction and remodeling at the high school - and the subsequent movement of teaching spaces - has caused some confusion and sparked several rumors in the community. The fact is our high school is not too small, and there will be plenty of spaces for students and teachers alike in the coming years. Architects and district and school staff have worked hard to design the high school efficiently to ensure we didn’t overbuild, which would have resulted in unused spaces and unnecessary expense. By working together with staff, we've found ways to convert some larger flexible spaces into learning spaces that teachers will utilize more frequently throughout the day. Next year's junior and senior classes are the largest within our system - creating an enrollment bubble that will make things tight, but manageable for the coming year. Subsequent classes are smaller and the high school will continue to have ample room into the future. Check out our Fact Check page for more details about classroom spaces at the high school. Our 9-12 grade music students have a unique opportunity this week when they were treated to a visit by the Minnesota Orchestra. The orchestra’s Symphonic Adventures program brought the entire ensemble to Stillwater Area High School for a dynamic, one-hour concert. Our junior high music departments had a very successful showing in Chicago recently. 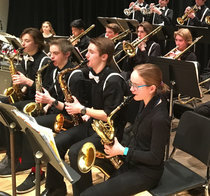 Students with the Stillwater Junior High bands, orchestra and choirs, as well as the Oak-Land Junior High choirs, competed at the Worldstrides Heritage Festival. The SJHS Red Band was named Top Band at the festival, outscoring several high school bands to win the Adjudicator Award. The SJHS band, orchestra and choir also won Festival Sweepstakes for the top three music groups. The 8/9 grade men and women’s choirs from OLJH both earned gold ratings. See the full list of awards. SAHS senior Collin Jinks won top honors at a national music competition. He took first place in the piano division at the Music Teachers National Association Senior Performance Competition. Last fall, we caught up with Jinks during his independent music study time at SAHS. Have a listen. Can't make it to a game or other high school activity? Keep up with the scores and news on Twitter at @goponies. Activities director Ricky Michel will tweet out updates and pictures from the many sporting events and activities that he attends. The school board will hold a closed session for attorney-client privilege in the matter of 834 VOICE v. ISD 834 on Thursday, April 27 at 5 p.m. at Central Services. See the official meeting notice. School board members and district staff will tour Alexandria High School, on Thursday, May 11 at 9 a.m. See the official meeting notice.